Stack wooden crates for a storage base. 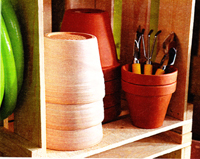 Use small shipping crates because they are the ideal size for holding stacks of pots. 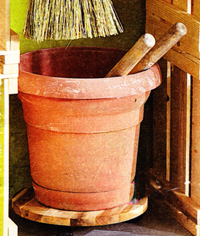 Keep inexpensive pots on hand for when you have a project that requires one or you are in the mood to plant something. Just stack the crates on top of each other - 2 high - and then top with a piece of wood from the local lumber yard. This is easy, portable, and no tools required. Maximize space with an overhead pot rack. Whether you have a green thumb or are completely green at gardening, having all your must haves in one place let's you confidently accomplish any task. A wall rack that keeps supplies in an easily accessible spot. You can use it to dry flowers on and the pot hooks always come in handy. 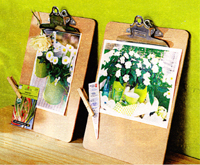 Clip up a gallery of inspiration: To sidestep pottery block keep your ideas just a glance away with a photo gallery or flower arranging idea. Surround your space with images that speak to you, motivate you or just makes you happy. Picture of plants you like to pot someday or flowers you hope to buy all go on the clip boards. Plant combinations for planters are hard to create but easy to copy. 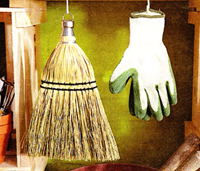 Hang essentials on a cup hook: A little whisk broom and gardening gloves are always on hand when you optimize the space underneath your work surface with cup hooks. 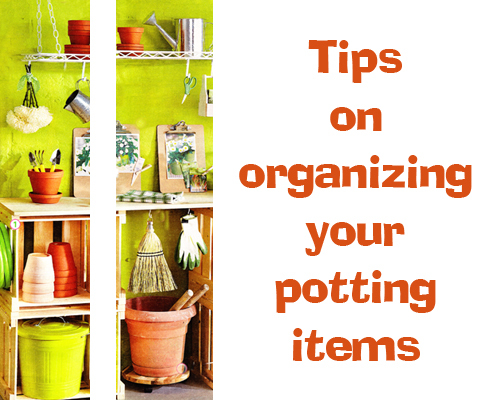 This often over looked area offers a bonus: If your potting area is outdoors, the overhand keeps soft items from getting damaged by rain. The hooks are easy to install with no tools necessary. They just screw in. 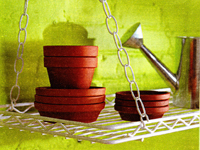 Transport pots with a push: Say goodbye to lugging around planters thanks to your own clever assistant - a wooden glider. This rolling base can hold up to 88 lbs, letting you move the heaviest pots with your fingertips. Don't want to make one then try the "Pot lifter" we sell that can lift up to 200 lbs.